HBO's Game of Thrones is currently deep within production on the epic fantasy series' final season, and it seems that the show is gearing up for a big battle scene in King's Landing. New photos from the Belfast, Ireland set have surfaced, and while most of the set has been blocked off from public view, there are still a few photos which seems to reveal that a large city set is being constructed. 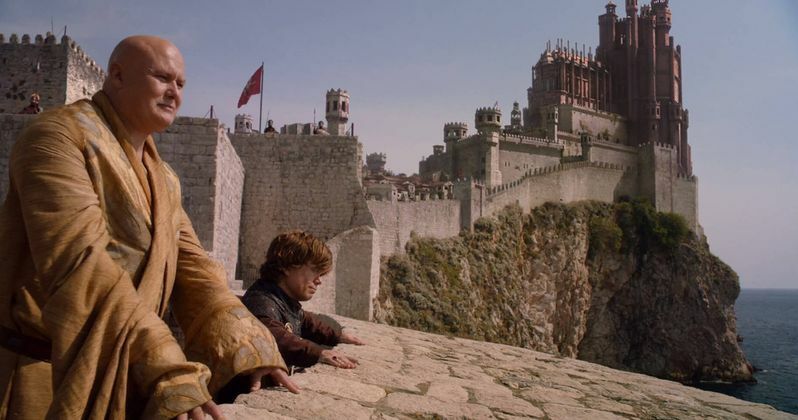 While no official details have been revealed, it's already been speculated that this set will be one of the seven primary entrances to King's Landing, which may be built for a massive battle set hinting that war will be coming to the Westeros capital. While there has been no confirmation that the sets in these photos are depicting a different part of King's Landing, this new report from Watchers on the Wall speculates that it's King's Landing, simply because the sets seem to feature "common city architecture," and not part of a castle. This logic rules out other locations such as the Red Keep and Harrenhal, so it certainly seems likely that this could be a previously-unseen entrance to King's Landing, which may or may not be ravaged by a battle scene. Still, that has yet to be confirmed, but there are new details about another scene recently being filmed that features the Unsullied warriors. The Unsullied warriors have been filming outside a Northern Ireland village known as Toome, while, in another village known as Moneyglass, another huge set is being built featuring the exterior of Winterfell. The Unsullied are getting ready to take on the Night King and his army of White Walkers, since this report reveals that all of the Unsullied spears have been outfitted with dragonglass. Last season, Jon Snow (Kit Harington) paid a visit to Daenerys Targaryen at Dragonstone where she allowed him to mine the dragonglass he was told about in a letter he received from Samwell Tarly. While the battle seemingly hasn't begun yet, that may happen shortly. The fields in Moneyglass are being fitted with large white tarps, which will serve as a foundation for the fake snow they will use on this set. This report also claims that, for the first time, the Winterfell walls will be a practical set instead of CGI walls that have been used in seasons past. With all of these tarps being used just outside the Winterfell set, it likely means there will be a large battle on this set as well. Still, nothing has been confirmed, but it's possible that Winterfell will be compromised or even breached by the White Walkers, who were last seen spilling into Westeros after The Wall came crashing down at Eastwatch in the final moments of the Season 7 finale. Unfortunately, these new Game of Thrones Season 8 set photos below don't feature any actual cast members, just some of the locations that the cast and crew will be shooting at in Northern Ireland. While this season will be just six episodes long, there have been rumors that each episode will be feature-length, like the 80-minute Season 7 finale that was the longest episode in the show's history, for now. Each of these episodes are rumored to cost a whopping $15 million, which will likely be worth every penny when the episodes finally debut, which will either be in late 2018 or possibly even in early 2019. While we wait for more details, take a look at these photos and visit Watchers On the Wall for their full report.